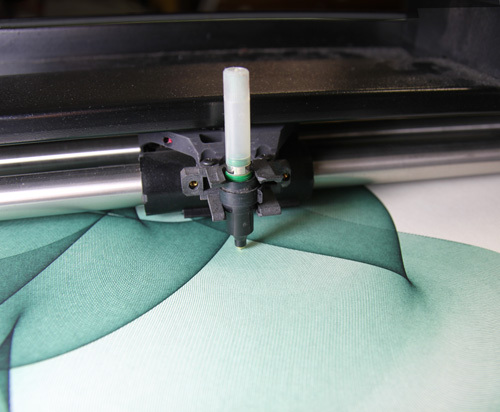 Detail of the drawing pen in a Summagraphics HiPlot pen plotter drawing arm as it executes Roman's drawing instructions. These cyberflower drawings require hundreds of lines to be drawn without pen failure. The ink pens have refillable ink wells. Several of these wells have been doubled in size to extend the number of lines they could draw without running dry. Pathway Studio, has evolved into a network of pen plotters that may be viewed as a modern day digital scriptorium. The studio network includes three multi-pen plotter work stations and a small gallery of Roman's work. He has adapted paint brushes to fit the drawing arm of his pen plotters. He views these plotters as electronic scribes employing procedures that are the present day equivalent of the drawing techniques practiced in medieval manuscript illumination. Roman with an HI DMP52 pen plotter. 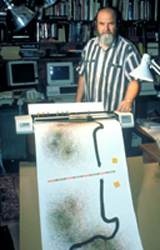 Shows drawing and brush plot near completion, 1989. The work nearing completion is "Lung Shan II" that was shown in the 1990 SIGGRAPH show in Dallas and with its traveling show to the Boston Computer Museum (1991). Drawing Technique. Roman's drawing techniques began to change radically after he followed a course in FORTRAN programming at the Control Data Institute in Minneapolis in 1970. A decade later, with his own studio PC he began writing algorithms that are coded instructions for executing his drawings. He developed a personal expert system that has been central to his work for well over a quarter Century. This page shows the hardware he uses to implement his software. But the creative side of his work is lodged in his code, the original programs (algorithms) that drive these machines. See his Briefing on Algorithmic Art for an orientation to his code. 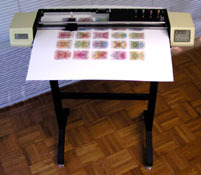 An HI DMP52 plotter that was in use in 1989 for creating the front and end pieces for the Boole book limited edition. 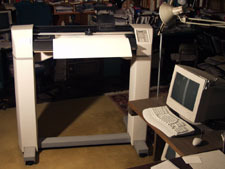 This plotter could control up to 14 ink pens and was followed by an 8 pen Houston Instruments DMP62 and then the HiPlot 7200. The HI DMP52 shown here was used for demonstrating 1980's techniques at the 2003 Ars Electronica exhibition "Code: the language of our time". The plotter failed on the last day following its last brush stroke but was revived for the opening of FEEDBACK at the new Center for Art & Technology, Laboral, Spain, 2007. One of three operational HiPlot 7200 pen plotters on our studio network. These units were put in service around 1995 replacing the DMP62's. It has 8 pen stalls. Roman's tools for creating his art join traditional artist's materials with computing procedures. The software he writes and the machines he uses converge in a studio environment committed entirely to a fine art literally grown with algorithmic procedures. First use of plotted brush strokes (1987). touch of gold leaf applied by hand. Many of the works include either this studio seal or a name seal. Image shows studio seal with sample imprint. The characters mean "Little Path Studio". Other seals are occasionally used. For detailed information click here. Pathway Studio Director. Alice Kennedy Wagstaff, PhD., (Deceased, 2009) married Roman in 1968 and helped him develop his digital scriptorium and the direction of his work. Visit her homepage that includes an on going series of her Haiku writings with graphics by Roman.